Participants of the 8th Asian Yoga Championship line up after the march-past at the opening ceremony at Jimmy George Indoor Stadium in the capital on Thursday. Young Ayan Agarwal of Panchkula, near Chandigarh, and Vidit Mehndiratta of Faridabad, Haryana, both cousins, are raring to make a mark in the 8th Asian Yoga Sports Championship that got under way in the city on Thursday. Ayan, who is taught yoga by his grandmother, is hoping to improve on his second position in the Asian Yogasana and third in artistic yoga at the last championship in Singapore, while Vidit, who was ranked fourth in Asian Yogasana last time around, wants to win a medal. The irrepressible Ayan loves doing yoga and is also aware of its health benefits such as relief from back pain. 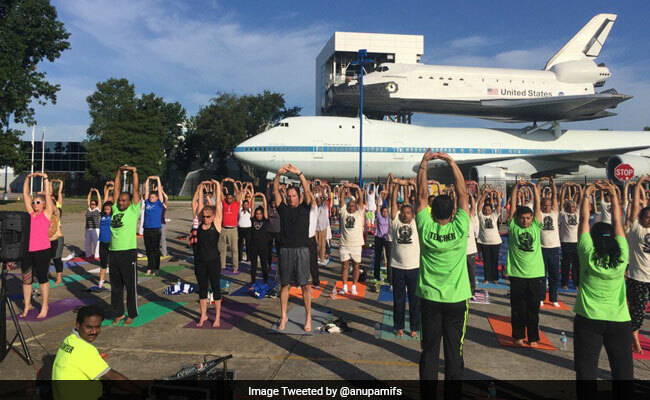 Organised by the Yoga Federation of India and the Yoga Association of Kerala under the auspices of the Asian Yoga Federation, the four-day championship will have nearly 350 participants from 13 Asian countries, including India, Iran, Singapore, Thailand, UAE, and so on. India is hosting the championship for the second time — the second edition was held in Hyderabad. Competitions are being held for various age groups in six categories — Asian Yogasana sports competition, Asian artistic yoga sports competition, Asian artistic pair yoga sports competition, Asian rhythmic yoga sports competition, Asian free flow dance competition, and Asian professional yogasana sports competition. Trinh Thi Ngan Phuong of Vietnam, a yoga teacher who runs her own centre in Ho Chi Minh City, is here as a referee. Trinh, part of a 20-member team from Vietnam, won a gold medal in the Asian professional yogasana sports competition in Singapore. Trinh learnt yoga from an Indian teacher Vinay in Vietnam and has been to Mysore too to improve her skills. At the inaugural function, Nouf Almarwaai from Saudi Arabia, D.S. Lingam Pillai from Malaysia, Seung Hwan Lee from South Korea, Srinivas Suresh Kamal from Thailand, Prabeer Karmakar of Hong Kong, Kumaresan Supramanian of Singapore, Nguyen Thi Ga from Vietnam, Indu Aggarwal and B. Balachandran from India were honoured with the ‘Yoga Ratna’ awards for their contribution to the field of yoga. Governor P. Sathasivam will inaugurate the valedictory of the championship on Sunday.